GM and seven-time US Women's Chess Champion Irina Krush keeps everyone guessing. She first shocked the American chess community in 1998, when she swept the U.S. Women's chess championship 8.5/9 to become the youngest ever U.S. champion. In 2001, she was the lowest rated player invited to the Mayor's Cup, an international round robin held in New York City. She won first place and also earned her first Grandmaster norm. Irina also won four US Women's titles in Saint Louis in a row in 2012, 2013, 2014 and 2015. A well-rounded player, Irina wins in both technical endgames and with brilliant attacks. She is known to be stubborn both on and off the board. If she feels her opponent has violated a basic chess principle, she'll search ardently for punishment and often find it. In 2013, Irina earned her final GM norm at the Baku Open. She wrote an in-depth account of her result for CLO and concluded: "The result was beautiful, but as you can see, it wasn't reached through a flight of inspiration. Four days of squeezing water out of stone." In 1999, Irina participated in the well-publicized Kasparov vs. the World match. Garry Kasparov, playing white competed versus a team of young chess masters. Irina was the team MVP, working tirelessly on her analysis and permanently changing theory with her novelty for the black side of the Bb5+ Sicilian. A mini scandal erupted when Irina's recommendation for the 58th move of the game was not considered due to an Internet glitch- the team lost quickly, but might have drawn if Irina's choice was selected. Irina has also been a valuable team member at Olympiads. In both the 2002 and 2004 Olympiads, she defeated World Women's Champion Xu Yuhua. These wins led to back-to-back American victories over the Chinese women's squad. 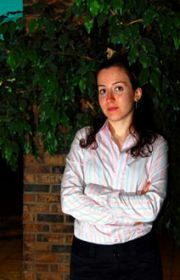 In the 2008 Dresden Olympiad, Irina Krush played first board, leading her team to bronze medals. Although team-mates Goletiani and Zatonskih had the big scores of the team, Krush again tallied a crucial win over the reigning Women's World Champion, GM Alexandra Kosteniuk. Irina moved to New York from Odessa, Ukraine when she was five years old. In May 2006, she graduated from NYU with a degree in International Relations. Outside chess Irina enjoys tennis, practicing French, photography, rapping and writing. After winning the 2010 US Women's Chess Championship, Irina even performed a short rap video for CLO. She is a frequent contributor to Chess Life Magazine.